This project was initially for Ferry Banda Sirma and Masampa. Their negative response to its implementation led us to the decision to relocate it to Mile 38 / Magbontoso. 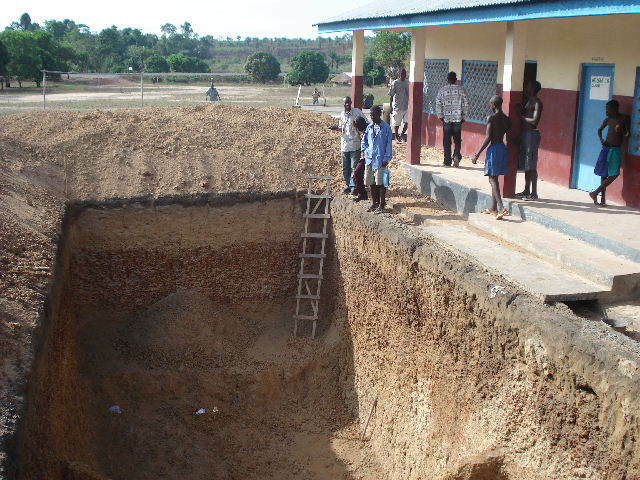 This school is among the schools in the proposal for the "Creation of 3 underground Rainwater tanks in the rural community schools of Port Loko District". That's also why initially only a 100,000 liters capacity tank was planned. 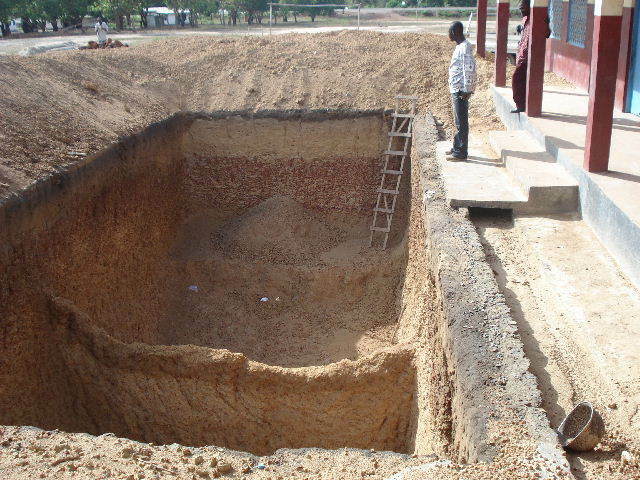 Due to the fact that this school is serving two nearby communities with a large population we considered a construction of a 150,000 liters tank. An additional amount was transferred from the proposed Ferry Banda Sirma/Masampa tank and Community Center project to be able to finance the enlargement. The tank is completed with all other fittings fixed. Harvesting of rainwater is now in Progress and will be chlorinated after harvesting is completed. We were supposed to build a 150.000 litres tank there. We implemented the project at the same time as the others, but unexpectedly we did not meet any cooperation of the two affected villages at all. 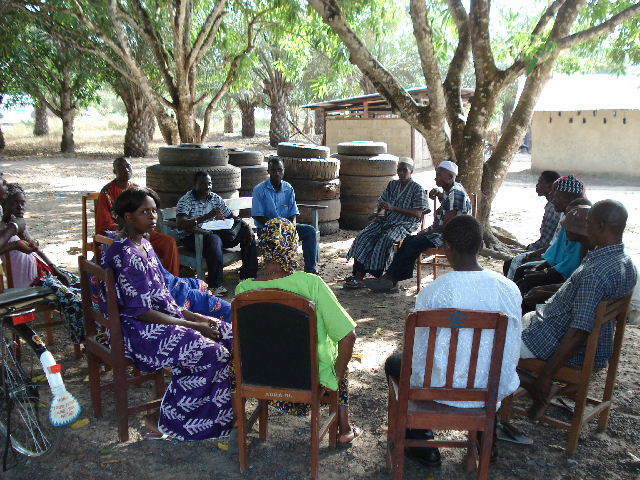 The two communities disagreed on who is responsible to provide the requested bush sticks and do the excavation. responsibilities the communities have to carry out after the completion of the tank, we decided not to continue our work there. 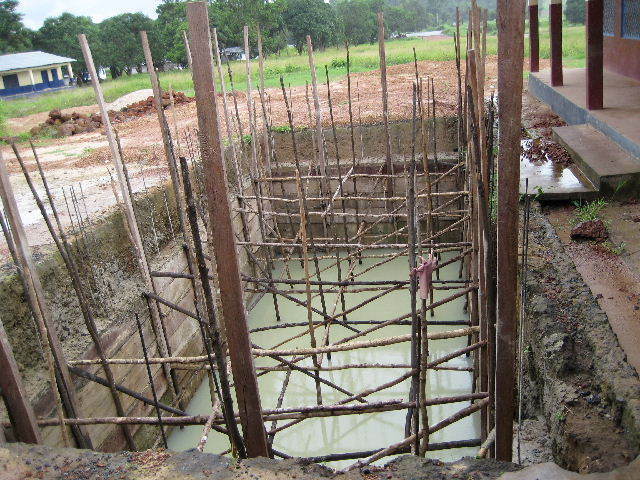 From approved funds provided to support overdue projects, we have been able to support the finally completion of the Rain Water Harvesting Tank construction at Magbontoso/mile38. The constructed tank will hold a total of about 150,000 litres of rainwater. The tank has been tentatively handed over to their respective heads of schools until the actual commissioning of the tank and handing over ceremony to the schools’ Committee. The schools’ committee from the two schools (The Primary and Secondary Schools respectively) will be responsible to over see the sustenance of the Rain Water Tank. Harvesting of rainwater is in progress. A total of 2501 beneficiaries will now have access to safe drinking water and have also benefited from the hygiene and sanitation training organized by the Safer Future Youth Development Project WATSAN TEAM. Community people USD 0.07(Le 200 ) per each bucket. Each student USD 0.17(Le500) per term. To have a better understanding of the attitude of a people and their constraints together. Some people could be in dire need of assistance but are reluctant to cooperate in receiving the favour. 8 teachers, 30 household heads and 501students getting knowledge about hygiene and sanitation.